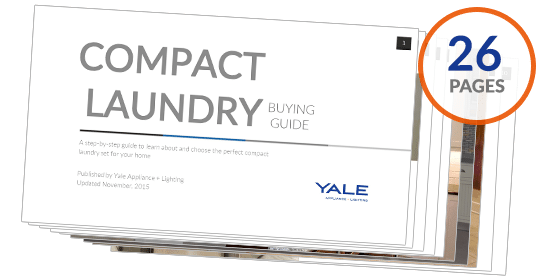 Struggling to choose a compact washer? Discover top brands & values in our buying guide. Heat pump dryers have intrigued me for a few years now. Although they have been in Germany for 13 years, I have to be conservative with new product because we service what we sell. The technology behind heat pumps, however, is compelling. It will use 50% less energy than other dryers and is gentler on your clothes. We will look at how a heat pump dryer works, then test it against the Bosch condenser dryer with two tests using towels and dress shirts. First, let us talk about ventless drying. Most of us grew up with vented dryers. Condenser and heat pump dryers require no venting to the outside. It will allow you to place laundry anywhere there is 220 volts and a water supply. So you can stack laundry in an upstairs closet and not trek to the basement to complete a load of laundry. 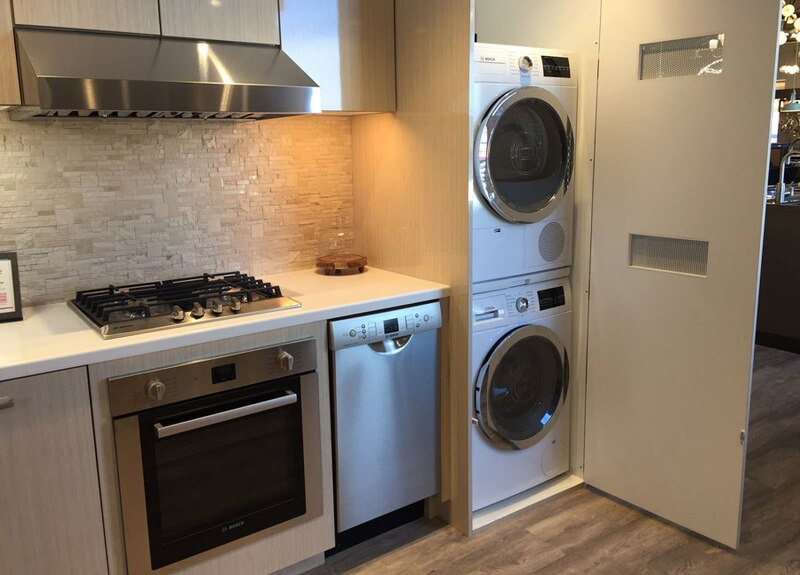 In cities like Boston, you can have laundry in your unit because of its smaller 24-inch size. For builders, this is now the preferred washer/dryer. It costs about $1,100 to cut a hole in an existing building. Also, ventless dryers are more efficient and are a must for LEED and Passive Home certification. The only downside to ventless is cycle time of roughly 2-3 hours to complete a cycle. In some of the newer vented full-size machines, it is less than an hour. Now let's look at heat pumps. How Does Heat Pump Dryer Work? Heat pump dryers use a compresser instead of heating elements to dry your clothes. Air is recycled through the machine. Turkish manufacturer, Beko, has the best definition of heat pump drying. They describe it as using hot air to absorb moisture from your clothes in order to get them dry after a wash.
After this air passes through the drum, it goes through the evaporator, which removes the moisture, then is collected as condensation and stored into a tank. The remaining air is reheated and sent back to the drum to start the cycle again and continue drying your clothes. Cliff notes version: The dryer heats the air. The moist air is cooled and then discharged as water. However, the air is then recirculated, so there is no outside air being used and exhausted like vented dryers. First is energy savings and with that money savings. Depending on your energy costs, you would probably save $75-$100 per year. Secondly, heat pumps dry at a lower temperature, so you have a much less a chance of shrinking your clothes. 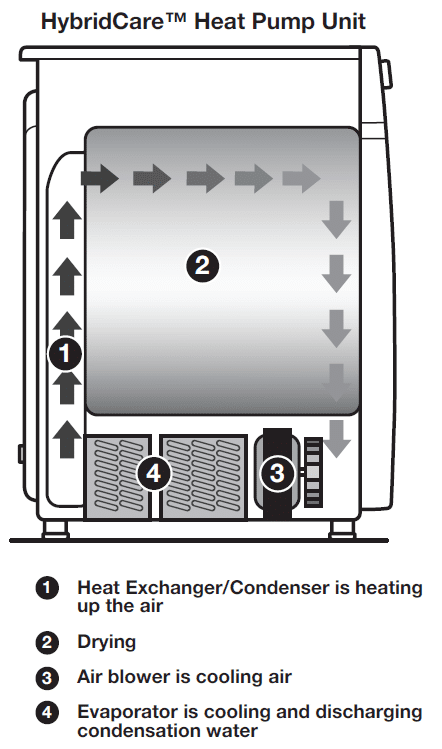 Lastly, heat pumps use existing air and do not pull air from the room like other ventless condenser dryers. For Massachusett residents, there will never be a problem with Make-Up air in a heat pump unit. We have a testing room in our Stoughton warehouse. I picked Paul MacDonald to conduct this test. He has a Bosch in his 1,700 square foot South End condo. I tested these two units all day yesterday here in the Stoughton high-quality testing facilities. 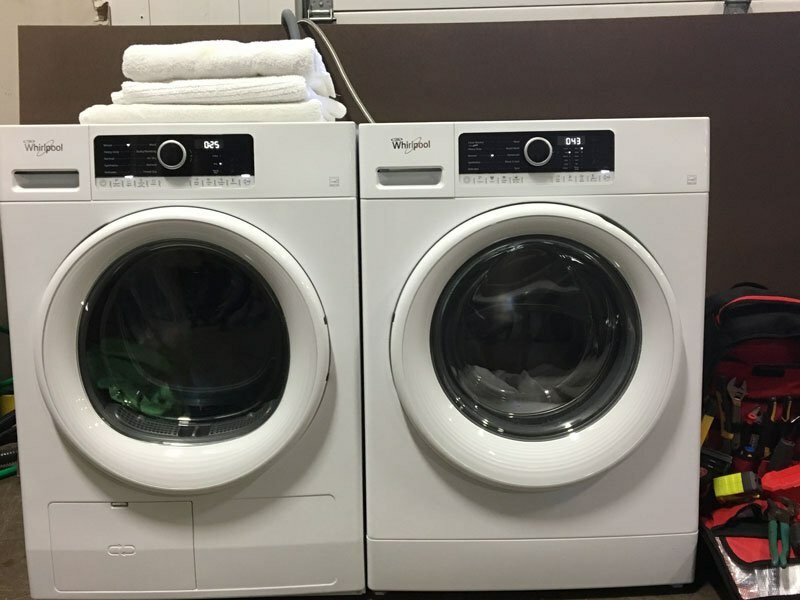 I compared them to my Bosch 800 series compact washer and ventless dryer at home. 4 standard bath towels not bath sheets. 10 long sleeve button up shirts. Both make relatively the same noise in my opinion. The Whirlpool heat pump has an added slight humming noise but not a big deal. In my 1,700 sq. ft. apartment, I know the Bosch units are running. Acceptable with the laundry closet door closed. Normal cycle: defaulted to 56 minutes, ran 56 minutes. Observations: good water level so that 100% of the load was equally wet. High-speed spin – slight vibration noise, good water extraction. Cotton normal: defaulted to 1:06, ran 1:06 minutes. Observations: often I find clothes with dry spots as if no water got to them consequently I always select extra rinse option. Test 1 - Normal cycle: defaulted to 1:49 and then self-adjusted to 1:20 – towels still damp and needed 20 min time dry to finish. Test 2 - Normal cycle: defaulted to 1:49 towels came out perfect at 1:49. Test 3- Normal cycle & extra dry. Unit defaulted to 2:02. I stopped it at 1:30 and towels were super dry. Test 4 - 10 shirts Normal cycle: defaulted to 1:49 self-adjusted but still ran 1:49 and shirts were very dry. Observations: great tumble action and the machine kept clothing off lint filter exhaust screen. Observation: Controls on Bosch equipment are finicky and hard to start. I like them both but no question; laundry takes longer. Both work fine without major issue other than dry time. The Whirlpool looks similar to the Bosch in terms of washing and drying time. The price on the Whirlpool is $1,799 compared to the Bosch at $1,999 plus the energy savings of $75 a year minimum. I would have loved to see a quicker cycle, but these machines are not designed to be fast unlike the full size front load washers. However, in terms of energy efficiency and cost savings heat pumps are the best dryer to consider. 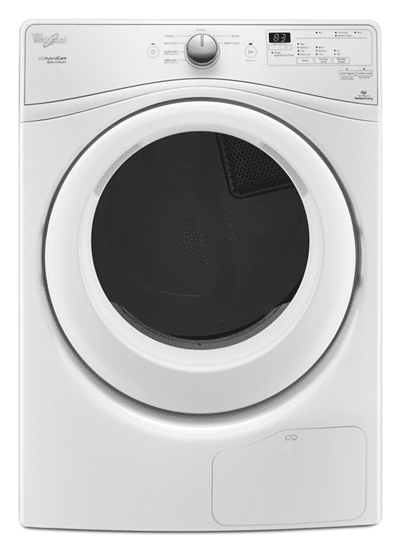 Get our free Washer Buying Guide with tips, trends and reviews of all the best brands. Over 220,000 people have already found answers in a Yale guide.